Scram Kitty And His Buddy On Rails is an on-the-rails shooter/plotformer developed by Dakko Dakko Games and has been one of the most anticipated eshop titles for the Wii U! Does the game live up to its hype? Keep reading to find out! 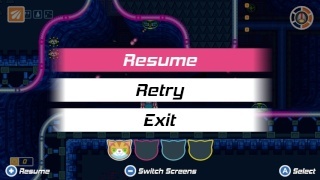 The gameplay in Scram Kitty is refreshingly unique in-terms of both its design and features! 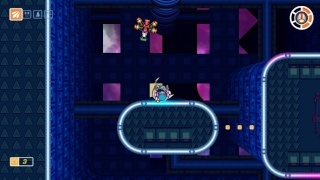 There are a few different modes of play including adventure where you must collect cats by doing various things in each stage including defeating bosses and collecting every item in the stage which is easier said then done as the levels are for the most part fiendishly difficult and traps will stop you in your tracks. 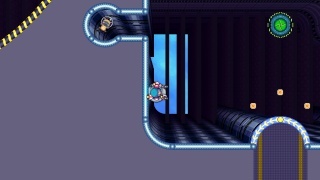 These traps are usually fair though there are a few exceptions that will force you to restart a stage. The level designs are brilliant and will keep you coming back to collect the cats that you missed to unlock more challenging levels! The final level of the game will challenge you more than any other game currently available on the eshop so be prepared to work towards beating the game! This isn't a bad thing though as it'll bring a sense of satisfaction to players when they finally see the game's ending! The controls are nearly flawless once you get used to them, but it'll take a few hours to figure out the game's physics. Overall there is nothing negative to mention about the controls of the game! The Off-TV Play works well with this game due to its gameplay having a handheld feel to it! There's no denying that Scram Kitty And His Buddy On Rails is a gorgeous game between its 2.5-D HD pixel art direction and highly detailed 3-D character and enemy models that really pop in HD Scram Kitty puts even certain retail throwback titles to shame! Scram Kitty And His Buddy On Rails also has a catchy soundtrack and the sound effects such as the weapons firing and the enemies death cry are crisp yet feel like they belong in a retro title in the 90's which fits the game well and sounds amazing! With perfect gameplay that will give you hours of enjoyment, nearly perfect controls, gorgeous visuals, and a catchy soundtrack Scram Kitty And His Buddy On Rails is easily one of the most polished Wii U eshop titles to date rivalling WiiWare equivalents such as La-Mulana and Cave Story! The only minor issue that the game has is that it takes a while to get used to the game's physics, but otherwise the game is flawless! There's just no reason not to add this amazing title to your Wii U digital games collection! I think the score is too high, but the game is still superb. I would have given the game a 8/10 nice review though I'm glad you enjoyed the game @Rukiafan! This is a great review! I'll get this after I finish Grinsia. This game sounds amazing and I plan on downloading this game next month! @SigourneyBeaver Thanks for the constructive criticism! @Nepgear you won't regret downloading this wonderful title. This is a wonderfully written review mate! This game has earned the perfect score it has been given in the review. I wasn't expecting a perfect score. I might need to download this then. Now I have to download Scram Kitty! I need to hone my skills more because I can't beat this game no matter how hard I try. This world could use more games as unique as this one. I completely agree with the review this game is perfect! Kitties rock and so does your review! @Talesfanatic wrote: Kitties rock and so does your review! I prefer mice myself, but whatever! This is a true masterpiece! Your comments are awesome lol! This review is great too! Well maybe I do need to look into this more! @Tech101 wrote: Well maybe I do need to look into this more! I downloaded the game yesterday and it's as good as the reviewer of this article stated! I'm amazed that this game has received some low scores on other websites. Thanks for the feedback you guys! It means alot to me. This game is seriously awesome a definite must have game for the Wii U! Hopefully more games with the level of quality that this game provides will be released on the Wii U eshop to make up for the lack of retail third party titles. @Kain wrote: This game is seriously awesome a definite must have game for the Wii U! @captainamerica wrote: Hopefully more games with the level of quality that this game provides will be released on the Wii U eshop to make up for the lack of retail third party titles. Nice review. This game is really fun, but I don't know if I'd consider it perfect though. This game seems to be a cut above the rest of the indie titles currently on the Wii U eshop so I will download this as soon as I have enough credit on my eshop account. Very good game and spot on review! The mechanics, controls, physics, and level designs are truly brilliant. Some of the challenges are hard but too satisfying. I couldn't stop playing until I got all 104 cats. (Took me 13h26min) so that's good value for the tenner it costs. @SKTTR wrote: Very good game and spot on review! Thank you for the feedback @SKTTR! Why is this game so hard? This game is too difficult, I'd give it a 7/10, but I understand why the game got a perfect score. If only I was better at playing games. 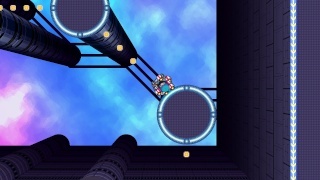 @Chickgoboom wrote: This game is too difficult, I'd give it a 7/10, but I understand why the game got a perfect score. If only I was better at playing games. I respect your opinion and completely understand why you might feel that the game is too difficult. Kushina wrote: Beautiful review Rukiafan! Thank you very much Kushina! I relish a good challenge.